Reminder! Exencial’s Next Teleconference - please join us for our first teleconference of the year, taking place on Tuesday, January 29th at 12:30 p.m. CST. Register here. Although the index has rebounded over the last month by climbing above 2,600 again,1 it continues to be a source of worry for many investors, and rightly so. Declines of this nature – significant and fast – can oftentimes mean the market fears something is very wrong. Recent media headlines, along with certain market predictions, seem to only affirm this notion. 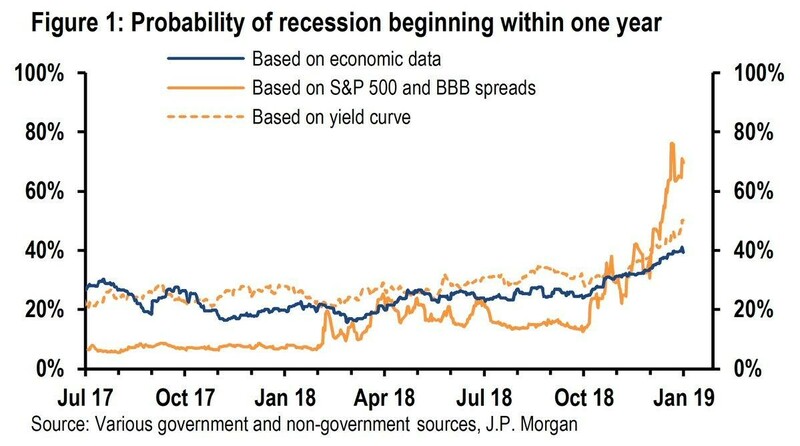 For example, J.P. Morgan recently issued the below chart indicating the market has priced in a nearly 80 percent chance of recession for 2019. These numbers don’t paint the picture of an economy that’s slowing enough to enter a recession in 2019. Looking at economic fundamentals, J.P. Morgan calculates the odds of a recession this year are about 40 percent, as indicated in the chart above. A significant deterioration would need to occur in fundamental data to result in a recession.However, with the market priced for a recession but the most recent economic data contradicting it, how should investors make sense of what may be cause for concern versus what may simply be noise? This is not to say that we will avoid a recession, as we will certainly see the economy contract at some point. The good news though, is that the impact of a recession has to a good degree already been priced in following 2018’s market pullback. It is also important to note that the 50 percent market declines we experienced in 2000 and 2008 are not common. 1 The U.S. has had 15 recessions since 1926 and in only five of these did the market decline near 50 percent or greater. 4 Most market declines that occur alongside or between recessions are not nearly as severe. Following the strong earnings of last year, the S&P 500 companies are delivering profit yields of about 6 percent5 and this compares favorably to other assets such as the bond market yields at about 2.5 percent. 6 Even if profits were to fall as the result of a recession, there is a greater margin of safety now priced into stocks that wasn’t there at the beginning of 2018.